Selena DeHart of Pink U Rock nail art blog is lending us her glossy nails for some mani love. 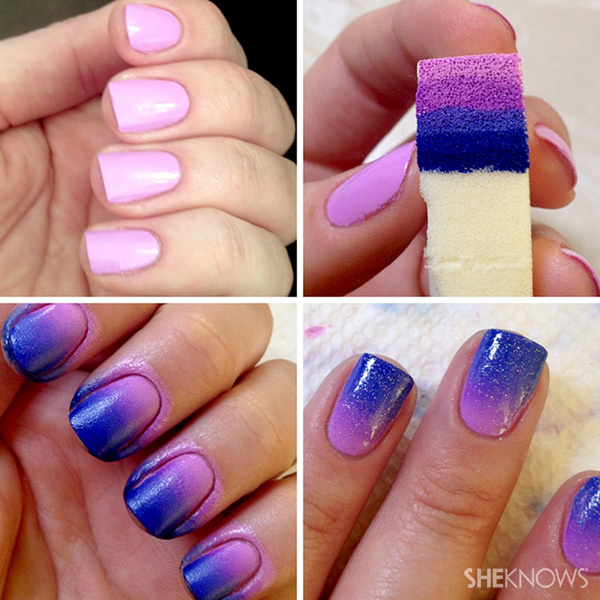 Check out her ombre nail design that screams, “It’s spring!” and find out how you can easily do this design yourself! It’s officially spring and it’s the perfect time to glam up those frosty winter nails! Rock an ombre look this spring without even touching your hair because this hot trend can be sported right on your fingertips. To get this look, you need to pick a color. For my look, I chose purple. You can choose three or four colors, all within the same color range but ranging from light to dark in shade. If you’re not quite the polish addict and don’t own that many shades of one color, you can choose one polish color and just add a few drops of white to each layer to lighten them up. Just mix the polish on wax paper or a paper plate with a toothpick to create a few different shades! For this tutorial, I will be using four different colors by Island Girl in the shades Island Paradise, Aloha Luau, Mahalo Dream and Waikiki Dream. Tools are minimal for this look. All you really need is a triangle makeup sponge. These can be purchased in most drug and grocery stores in the makeup and beauty section. Also, grab a few Q-tips to clean up around your nail when you’re done. Paint your nails the lightest shade that you picked in your bunch and let dry to the touch. On the tip of your makeup sponge, start painting thin stripes of each color across the sponge. I prefer the lightest color to be at the cuticle, but this is completely up to you. Make sure you paint your stripes from dark to light or light to dark, depending on the placement you chose. For this tutorial, I’m going light to dark. Lightly dab the color onto your nail using light dotting motions. Don’t press too hard, and make sure you dab up and down and also side to side just a bit to blend all the colors smoothly. Repeat the last step until you have the desired opacity. Just make sure each layer is mostly dry to the touch before adding a new layer. Apply your favorite top coat immediately. This helps to flawlessly blend the colors for that perfect ombre look. Clean up any excess polish around your nails, and you’re done! 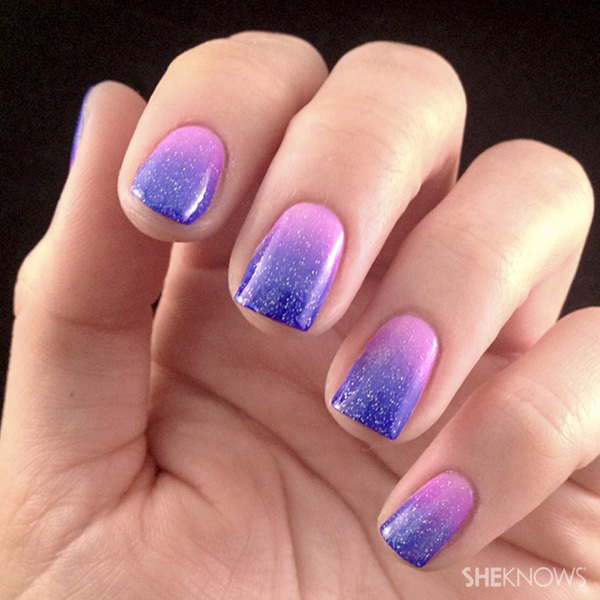 If you feel like you want something a little more, you can add some sparkle to the ombre. This step is completely optional. I like to use China Glaze Fairy Dust over the top for just a hint of added sparkle!